A new extrasolar planet has been found at the ESO La Silla Observatory as a companion to iota Horologii (iota Hor). This 5.4-mag solar-type star is located at a distance of 56 light-years and is just visible to the unaided eye in the southern constellation Horologium (The Pendulum Clock). The discovery is the result of a long-term survey of forty solar-type stars that was begun in November 1992. It is based on highly accurate measurements of stellar radial velocities, i.e. the speed with which a star moves along the line of sight. 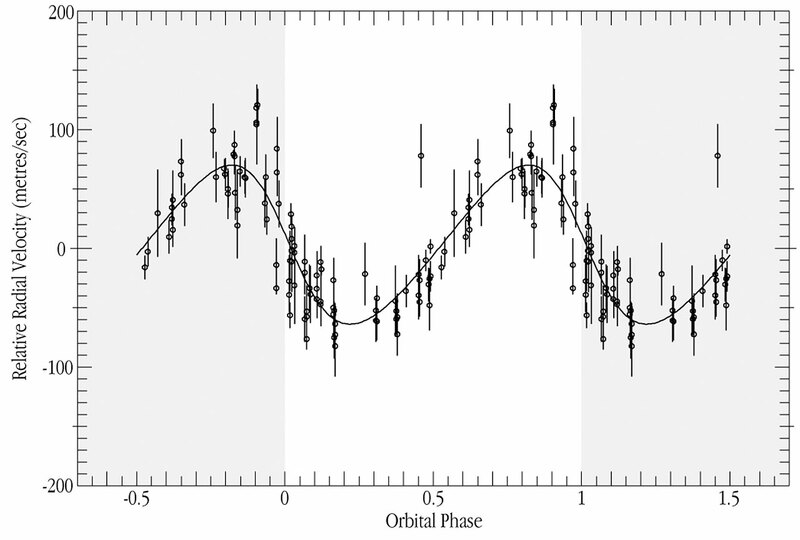 The presence of a planet in orbit around a star is inferred from observed, regular changes of this velocity, as the host star and its planet revolve around a common center of gravity. Since in all cases the star is much heavier than the planet, the resulting velocity variations of the star are always quite small. The team that found the new planet, now designated iota Hor b , consists of Martin Kürster , Michael Endl and Sebastian Els (ESO-Chile), Artie P. Hatzes and William D. Cochran (University of Texas, Austin, USA), and Stefan Döbereiner and Konrad Dennerl (Max-Planck-Institut für extraterrestrische Physik, Garching, Germany). iota Hor b represents the first discovery of an extrasolar planet with an ESO instrument . The finding is based on data obtained with ESO's highest-resolution spectrograph, the Coudé Echelle Spectrometer (CES) at the 1.4-m Coudé Auxiliary Telescope (CAT). While this telescope has recently been decommissioned, the CES instrument is now coupled via an optical fiber link to the larger ESO 3.6-m telescope, thus permitting the continuation of this survey. The high precision radial velocity measurements that are necessary for a study of this type were achieved by means of a special calibration technique. It incorporates an iodine gas absorption cell and sophisticated data modelling. The cell is used like an optical filter that adds its own absorption features to the absorption line spectrum of the star. When the radial velocity of a star changes, the wavelength of its spectral lines will shift according to the Doppler effect. They are then seen to move, relative to those of the iodine spectrum. Because of the relative nature of this measurement, the shift and hence the star's velocity change can be measured with a precision that is much higher than what the mechanical/optical stability of the spectrograph would otherwise allow. This particular technique is currently being applied by several research groups in the world and has led to most of the recent extra-solar planet discoveries. For the star iota Hor , a measurement precision of about ± 17 m/sec (± 61 km/hour) was achieved. This is a very high accuracy in astronomical terms and it enabled the astronomers to detect radial velocity variations with an amplitude of ± 67 m/sec (or 134 m/sec peak-to-peak), cf. eso9938a, eso9938b. Five and a half years of monitoring and 95 individual spectra with exposure times between 15 and 30 minutes eventually revealed the presence of a planetary companion . iota Hor b has an orbital period of 320 days. From this period, the known mass of the central star (1.03 solar masses) and the amplitude of the velocity changes, a mass of at least 2.26 times that of planet Jupiter is deduced for the planet. The new giant planet is thus moving in an orbit not unlike that of the Earth. In fact, of all the planets discovered so far, the orbit of iota Hor b is the most Earth-like. Also, with a spectral type of G0 V , its host star is quite similar to the Sun (G2 V). iota Hor b is, however, at least 720 times more massive than the Earth and it is probably more similar to planet Jupiter in our own solar system. While the radial velocity technique described above only determines a minimum value for the planet's mass, an analysis of the velocity with which the star turns around its own axis suggests that the true mass of iota Hor b is unlikely to be much higher. Natural phenomena with periods near one solar year always present a particular challenge to astronomers. This is one of the reasons why it has been necessary to observe the iota Hor system for such a long time to be absolutely sure about the present result. First, special care must be taken to verify that the radial velocity variations found in the data are not an artefact of the Earth's movement around the Sun. In any case, the effect of this movement on the measurements must be accurately accounted for; it reaches about ± 30 km/sec over one year, i.e. much larger than the effect of the new planet. In the present case of iota Hor , this was thoroughly tested and any residual influence of the Earth's motion can be excluded. A second complication arises from the fact that for Earth-bound telescopes, the visibility of a particular star changes in the course of the year. This creates `windows of opportunity', i.e. certain times when a given star can best be observed. That leads to a tendency to observe and re-observe the star when the planet is in the same part of its orbit. The full variation in radial velocity will therefore only be revealed after a sufficiently long time span has elapsed, covering several revolutions of the planet around the central star. More planets in the iota Hor system? The comparatively high scatter of the data points from the best fitting radial velocity curve presents an additional puzzle. While the accuracy of these measurements was determined as ± 17 m/sec (for other, similar stars, with and without known planets, an even higher precision of ± 14 m/sec was found with the same instrument), the scatter of the measurements around the mean velocity curve is higher, about ± 27 m/sec. This indicates that the discovered planet cannot be the whole story. There are two possible explanations for this additional variability. Either there is a second planet with another period in the same system, or activity on the surface of the star causes slight changes in its spectrum, influencing the velocity measurements. There are in fact indications that iota Hor is more active than the Sun, hence making the second explanation quite plausible. If so, it appears that the new planet is orbiting around a relatively young star, since such stars are typically more active than older ones like the Sun. One of the next steps during the investigation of iota Hor will therefore be to get clues to its age. In any case, it is important to learn more about the properties of planetary orbits around young stars, in order to improve the theory of star and planet formation. After an upgrade to a spectral resolution more than twice as high as before, and with the larger light collecting power of the ESO 3.6-m telescope at its disposal, the CES spectrograph is now ready to perform direct measurements of the spectral instabilities that might cause the additional radial velocity variations in iota Hor . This project is high on the list of the discoverers. However, they will also follow-up the other explanation - a second planet. 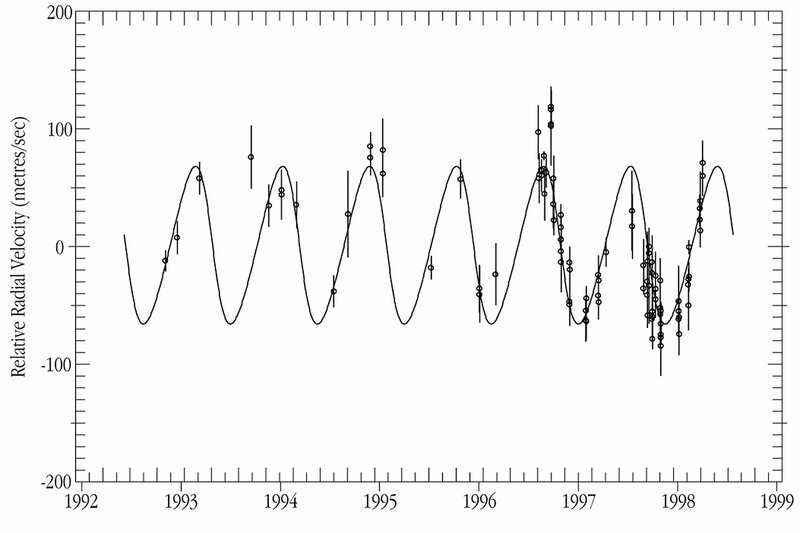 Longer series of measurements may reveal additional companions in orbits with longer or shorter periods of revolution. Observations of iota Hor will therefore be continued for several more years. Due to its rather complex radial velocity variations, iota Hor may thus soon become one of the better studied stars in the southern sky. Extrasolar Planets are also being found with the 1.2-m Swiss telescope at La Silla. An early success was described in eso9818.